The American Dental Association has developed the Dental Admission Test to measure the knowledge and skills of individuals who are applying to dental school. 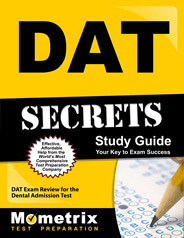 Although this test is not the only factor considered by dental school admissions departments, the DAT has earned a reputation as an accurate predictor of success in dental school. The DAT is divided into four constituent elements: Quantitative Reasoning Test (40 items); a Perceptual Ability Test (90 items); a Reading Comprehension Test (50 items); and a Survey of the Natural Sciences (100 items). The Quantitative Reasoning section of the exam consists of Mathematics Problems (including algebra, 9 items; numerical calculations, 6 items; conversions, 6 items; probability and statistics, 4 items; geometry, 4 items; trigonometry, 4 items) and Applied Mathematics Word Problems (7 items). This section of the exam takes 45 minutes. The Perceptual Ability Test consists of 90 questions in the following six areas: apertures, angle discrimination, cube counting, form development, paper folding, and view recognition. This section of the exam takes one hour. The Reading Comprehension Test consists of 50 questions based on passages of moderate length concerning topics in science and dentistry. This section of the exam takes one hour. The Survey of the Natural Sciences includes questions on the following subjects: Biology (cell and molecular biology, 13 items; diversity of life: biological organization and relationship of major taxa, 3 items; structure and function of systems, 9 items; developmental biology, 4 items; genetics, 7 items; evolution, ecology, and behavior, 4 items); General Chemistry (stochiometry and general concepts, 3 items; gases, 2 items; liquids and solids, 3 items; solutions, 3 items; acids and bases, 3 items; chemical equilibria, 2 items; thermodynamics and thermochemistry, 2 items; chemical kinetics, 2 items; oxidation-reduction reactions, 2 items; atomic and molecular structure, 3 items; periodic properties, 2 items; nuclear reactions, 1 item; laboratory, 2 items); and Organic Chemistry (mechanisms (energetic, structure, and stability of intermediates), 5 items; chemical and physical properties of molecules and organic analysis, 5 items; stereochemistry, 3 items; nomenclature, 2 items; individuals reactions of the major functional groups and combinations of reactions to synthesize compounds, 9 items; acid-base chemistry, 3 items; aromatics and bonding, 3 items). The Dental Admission Test is administered by Thomson Prometric throughout the year at hundreds of locations around the country. This site has no affiliation with the DAT and is not endorsed by the DAT. Ace the DAT test using our DAT exam study guide with practice questions. 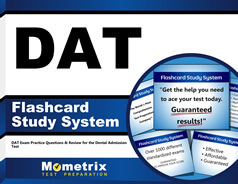 Quickly Solve Difficult DAT Test Questions with the DAT Flashcard Study System.